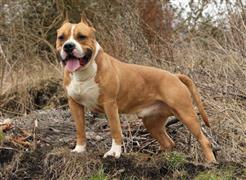 American Staffordshire Terriers are often given strong names that reflect their stocky build. A few stout names that are common include Tank, Capone, and Magnum. In 1972, the AmmStaff was given a separate name from the English Staffordshire Bull Terrier to distinguish it as its own breed. Around this time was the decline of the American muscle car. A unique source of powerful dog names can be taken from popular muscle cars. Boss, Shelby, Cobra, Maverick, and Torino are some names taken from the Ford car lineup. Chevelle, Challenger, Cyclone, Rebel, Duster, and Camino are other top muscle car picks. With ancestors coming from Staffordshire, England, it is only fitting that the breed often dons an English name. Charles, London, Trafford, Oscar, and Harvey are a few English names that are common among the AmmStaff. Some of our pages will contain a subcategory. A subcategory is a slightly more specific grouping than the main topic of the page. For a subcategory, we will include a separated table of names and corresponding descriptions. An example of a subcategory of Red Dog Names would be 'Dog Names Inspired by Red Wines'. If you have any subcategory ideas for the American Staffordshire Terrier Names page, we would love to hear them. Use the form below to submit your ideas.